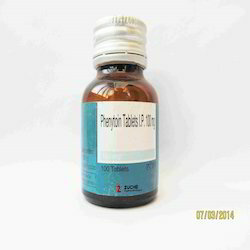 We are involved in offering Phenytoin Tablets to our clients. Our offered tablets are used to provide protection against seizures by causing voltage-dependent block of voltage-gated sodium channels. Our offered tablets have low affinity for resting sodium channels at hyperpolarized membrane potentials. It is widely prescribed for nerve related diseases. In order to keep pace with never ending demands of the customers, our company is instrumental in offering Turmeric Curcumin Black Pepper Capsules.